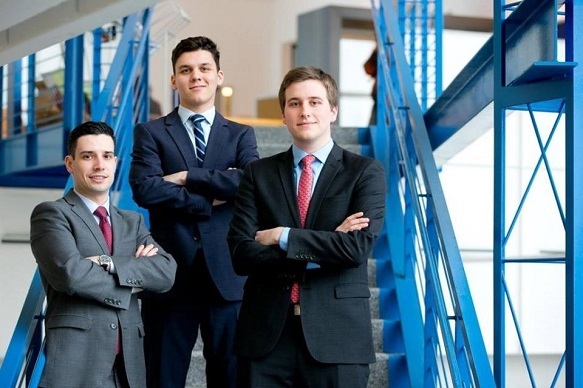 Antoine Camus, Gabriel Grenier and Yannick Martineau Goupil, of the HEC Montréal Student Investment Fund, easily took the prize for the best La Presse readers’ portfolio. Their portfolio maintained a total return of over 10% since the summer, and they ended the year up 13.4%. Five out of ten investments were winners, with one actually doubling in value. Don’t simply copy the same sector weighting as in the stock market index. Make sure you understand companies’ business models so as to identify each one’s competitive advantages and risks. Don’t be afraid of investing outside of Canada. The three Fund members were invited at the start of 2015 to choose the 10 most promising stocks for 2015, out of a list of 100 Canadian stocks pre-selected by the Montreal daily’s team, focusing on the sectors most likely to benefit from international economic growth. Gabriel Grenier, Yannick Martineau Goupil and Antoine Camus.